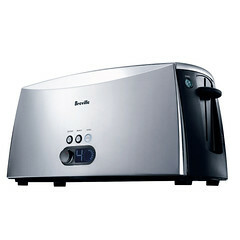 The Breville ikon 4-Slice Toaster — Lift And Look control crisps perfect toast. 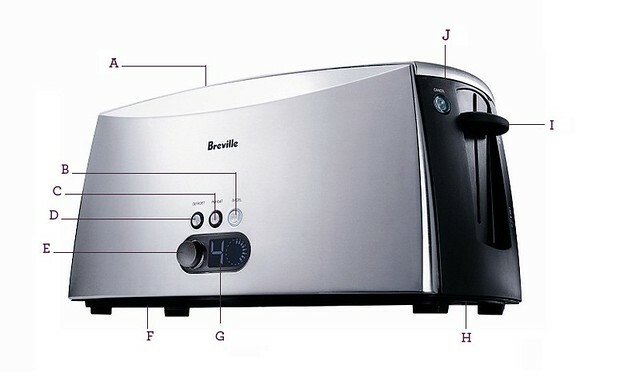 Check toast without canceling the cycle. A. Extra Wide, Extra Deep Self-Centering Slots. B. Bagel Button. C. Reheat Button. D. Defrost Button. E. Browning Control Dial. F. Cord Storage. G. LED Display. H. Removable Crumb Tray. I. High Lift and 'Lift & Look' Lever. J. Cancel Button.